Texture as a design element is often made to play second fiddle to some of its more obvious kin: line, color, even shape; but it can be a very effective tool in our bag of photographic tricks. It is important here to note the difference between tactile and visual texture. Tactile texture is what we feel when we touch a surface whether it be two dimensional–a piece of fabric, or three dimensional– a marble sculpture. Visual texture is the representation of a three dimensional surface in two dimensions. As photographers working within the confines of two dimensions, we are limited to the visual representation. Everything has texture. It can be rough and aggressive, it can be smooth and subtle, or it can be somewhere in between. In this image the textures range from rough (the trees) to softer (the grasses) to softest (the low clouds). 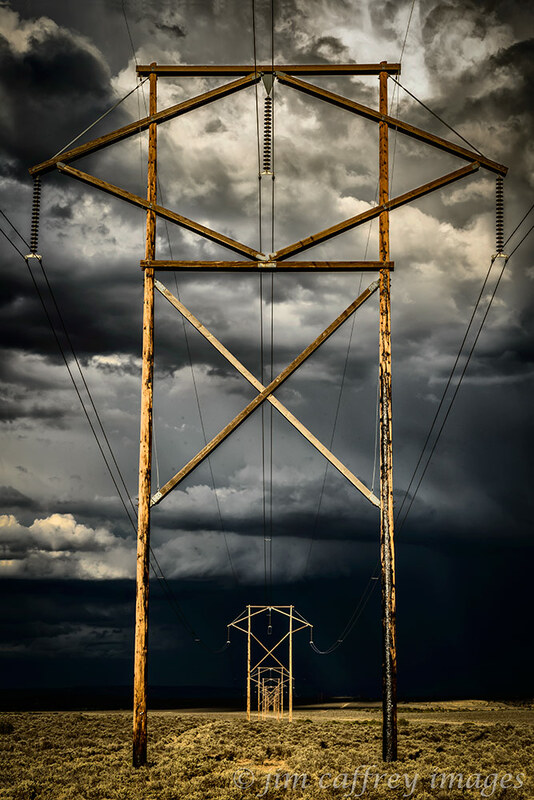 Texture can make an image more interesting by inviting the viewer to explore the interactions and relationships between the visual elements within the frame. Textural differences add another design element to an image: contrast. 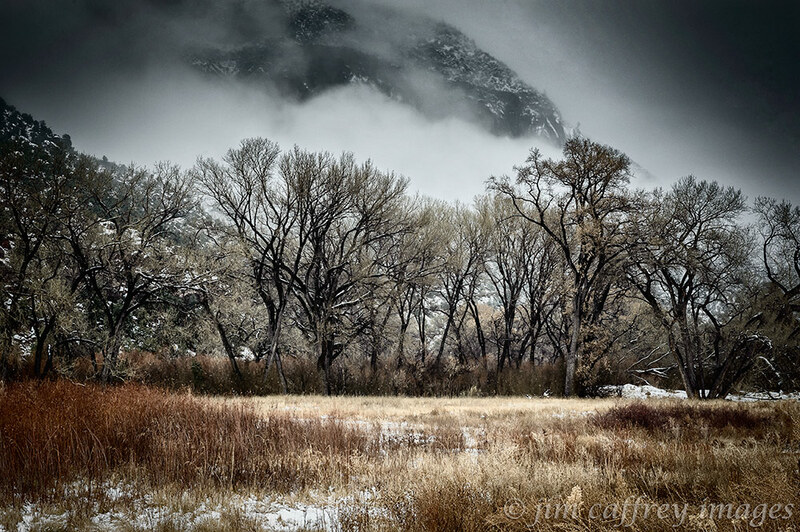 The visual contrast in this image of cottonwood trees during a winter storm gives the viewer a reason to delve more deeply into the image; it attracts the eye and lets the person viewing the image know that I found the contrast between the low hanging clouds, the trees, and the grasses interesting enough to stop and make a photograph. On another level, the repetitive, more aggressive texture of the trees in the photograph creates a pattern or motif which stands out and dominates the more subtle blending of the background clouds and foreground grass, so the trees become the focal point of the image. 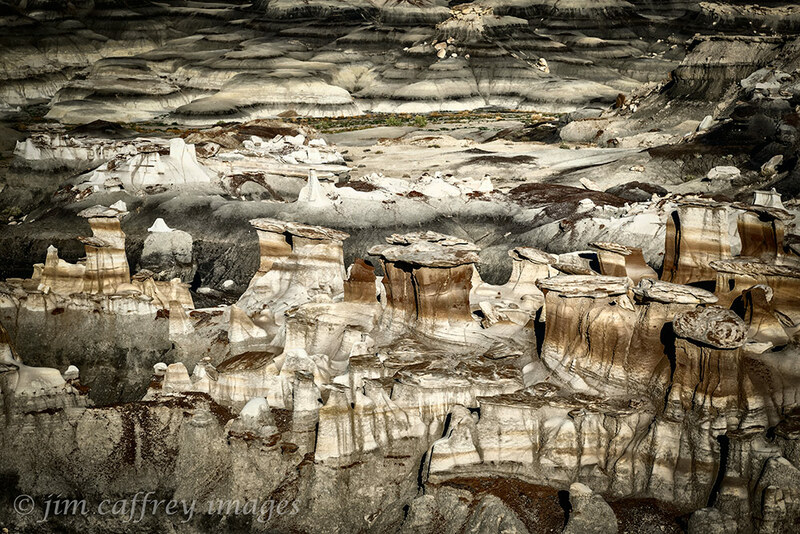 Finally, the different textures within the image create layers which add depth both visually and conceptually. It’s easy to fall into a rut. It’s not so easy to climb out of one. Often when we find a certain process, or visual framework that works for us, it becomes hard to move on from there. This kind of dependency works against the creative process by stifling our ability to see things in a new way. Sometimes the only way to escape this trap is to be intentional and to actively seek new answers, new ways of seeing or experiencing the world around us. It matters little if you are famous or unknown, creative growth demands that you evolve. It is the natural order of things. If you find a niche in which you are comfortable, it is important that you keep exploring new ideas and processes, otherwise it is only a matter of time before your niche can become a prison from which escape will become harder and harder the longer you inhabit it. I’m not saying that we need to totally discard the things that work for us, but we do need to keep the edge sharp. Like anything else in life, creativity suffers from narrow-mindedness. So, don’t be afraid to try something new or different. The results may surprise you.